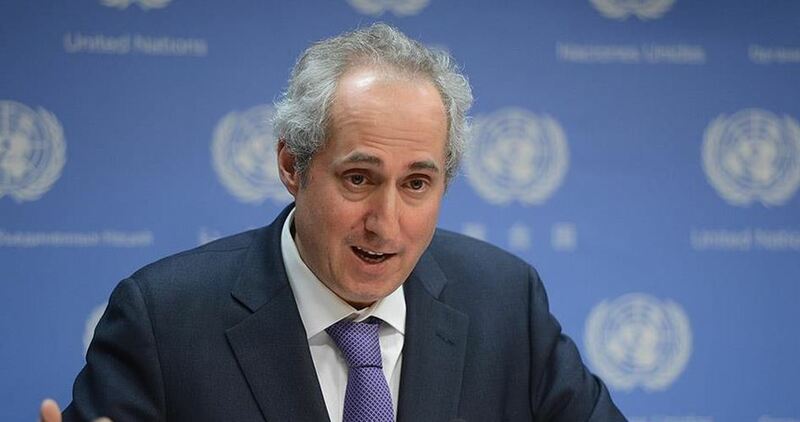 The UN on Friday called on Israel to conduct an immediate and complete investigation into all incidents in which the use of force led to the death or injury of Palestinian citizens in the occupied territories and the Gaza Strip. “Special Coordinator for the Middle East Peace Process, Nickolay Mladenov, has expressed his concern at the continuing clashes between Palestinians and the Israeli security forces in the occupied West Bank and Gaza, including the two teenagers who were killed [on Thursday],” Stephane Dujarric, spokesman for the secretary-general, told journalists at the UN headquarters in New York. “All incidents in which the use of force has resulted in death or injury must be promptly and thoroughly investigated,” he said. Two Palestinian teenagers were cold-bloodedly shot and killed by Israeli soldiers on Thursday during angry protests against the US recognition of Occupied Jerusalem as Israel’s capital. A Palestinian teen from the Gaza Strip was killed east of the Bureij refugee camp after a live round was fired into his chest. Three other Palestinians were wounded, one critically. In the West Bank village of Iraq Burin, south of Nablus, a 16-year-old boy died in hospital after he was shot by an Israeli soldier, without firing warning shots. Amhad Abu Rahma, the brother of the late Bassem Abu Rahma, who killed by a high-velocity tear gas canister fired at his chest at close range in 2009, spoke with the IMEMC Friday about the current status of the family’s court case against the Israeli military. The lawyer spoke to the family on Friday and told them that they have reached the end of the legal appeals in the case of Bassem’s killing. The Israeli court admits that Bassem was killed, and that it was the soldier’s fault. Despite having one officer and three soldiers called for questioning, the court claims that it had done what it could. But the court has said there is nothing it can do, because they allegedly don’t know the name of the solider who shot Bassem, or even the name of the officer. Court officials told the family’s lawyer that the file of Bassem Abu Rahma was stolen from the court, and that for that reason, they have an incomplete file on the case. The Israeli court also says that there was never a clear investigation into the case of Bassem’s death, and that now, due to the stolen file, they do not have enough evidence to continue the prosecution. The court will not accept any appeal to its decision, or any separate case against the soldiers. They have said that they will not push for any further investigation. But the family says they are not giving up in the struggle for justice for Bassem Abu Rahma. They want to expose the hypocrisy of the Israeli court system, by exposing this case through the media. There is no ambiguity in the case, according to Bassem and other family members. The soldier who shot him clearly aimed and shot, and the Israeli military has admitted to this fact. “We will take the case to international court, if we are unable to achieve justice in the Israeli court”, Ahmad told the IMEMC. After the Israeli High Court closes the case, there is no further appeal possible in the Israeli court system. Ahmad noted that the Israeli Court System has no practice or intention of prosecuting the soldier who shot his brother, adding that the Israeli Court System is meant to protect the soldiers, not to hold them responsible for their crimes. Despite the fact that the military admits that they killed Bassem, they will not hold any soldier responsible for the crime. The family says that the identity of the soldier can be clearly ascertained from the video that shows Bassem being killed. But because the file was ‘stolen’ from the court, no soldier will be prosecuted. Ahmad Abu Rahma stated, “For seven years this case has been ongoing – the Israeli military has dragged its feet at every step, and delayed every court appearance until this point was reached. And now, after all this time, they are dismissing the case based on the bogus claim that they cannot determine the identity of the soldier who shot him. The Weekly protest in Bil’in village, west of Ramallah in the central West Bank, was held Friday, commemorating the eighth anniversary of the death of Bassem Abu Rahma, one of the senior figures of the popular resistance in the village, who was killed by Israeli soldiers during a nonviolent protest against the illegal Israeli Annexation Wall and colonies. Bassem Abu Rahma was killed at age 31 on April 7th, 2009, when an Israeli soldier shot him with a high-velocity teargas bomb directly in the chest. His sister, Jawaher Abu Rahma, asphyxiated to death, on January 1st 2011, after the soldiers fired dozens of gas bombs at nonviolent protesters. 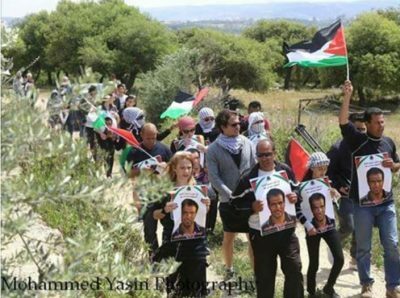 Friday’s procession was organized by the Popular Committee against the Wall and Colonies in Bil’in, and was attended by dozens of locals, accompanied by Israeli and international peace activists. The protesters marched from the center of the village, carrying Palestinian flags and posters of Bassem, in addition to pictures of many Palestinian political prisoners, held by Israel, and called for their release, especially as the detainees are preparing for an extended hunger strike, staring on April 17th – Palestinian Prisoners Day. Some protesters burnt tires near the gate of the Annexation Wall, expressing their rejection of the ongoing illegal Israeli occupation and colonization of Palestine, while the soldiers used surveillance drones to film the protesters. 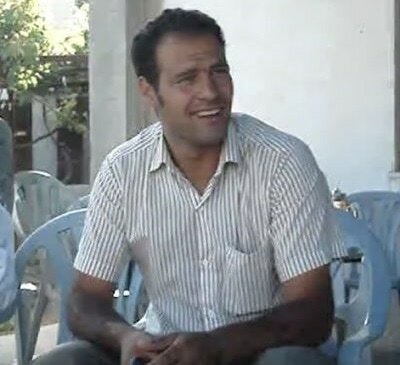 Coordinator of the Popular Committee against the Wall and Colonies in Bil’in, Abdullah Abu Rahma, said the village started its activities in support of the Palestinian detainees as they mark April 17th, and called for massive popular protests in every part of occupied Palestine, in support of all political prisoners, who are facing constant harassment, violations and abuse. Nonviolent activist and the brother of Bassem and Jawaher, Ashraf Abu Rahma, told the IMEMC that the lawyer representing the family in Bassem’s case in Israeli courts, said the Israeli military is claiming it does not know the identity of the soldier who shot him, and is trying to get the court to close the case. Ashraf Abu Rahma himself has faced violent attacks against him by Israeli soldiers, like his two murdered siblings. In July of 2008, Ashraf was detained by Israeli soldiers during a nonviolent protest in the nearby village of Ni’lin, and after he was handcuffed and blindfolded, an Israeli soldier standing next to him pointed his gun at his leg and shot him with a rubber-coated bullet. The shooting of Ashraf was also caught on tape by a young Palestinian girl; Israeli soldiers kidnapped her father later as a punishment for publishing the video and exposing their crime. Also on Friday, Israeli soldiers also assaulted the weekly nonviolent protest against the Annexation Wall and colonies in Ni’lin village, west of Ramallah, and wounded a young Palestinian man before abducting him. 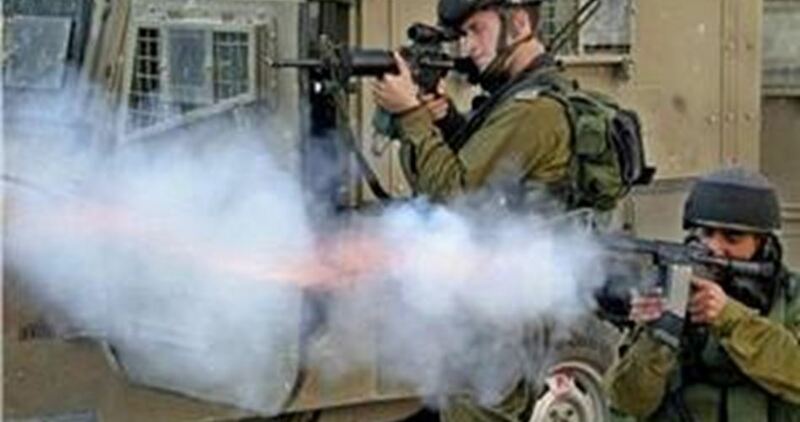 In related news, the soldiers attacked the weekly protest in Kufur Qaddoum town, in the northern West Bank district of Qalqilia, and shot three children with rubber-coated steel bullets, in addition to causing many protesters to suffer the effects of teargas inhalation.